Caption slip reads: "Photographer: Emery. Date: 1958-07-27. Reporter: Emery to Caswell. Assignment: Girl passenger of 'attempt suicide' driver. 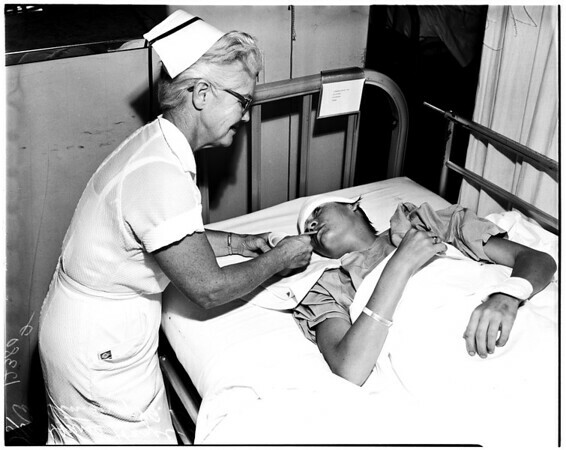 97/45/44: At Community Hospital, Long Beach, l to r: Mrs. Hazel Quinn, nurse in charge of 3d North Ward 3 to 11 pm, helps Miss Phyllis Jo Ann Aultman, 19, of 1311 Electric Ave., Seal Beach, sip tea through glass tube".